SPRINGDALE, Ark - The Northwest Arkansas Naturals are proud to have partnered with Mercy Kids on our Mercy Kids Most Improved Student Program, which gave teachers a chance to reward students for making progress during the year. The Naturals will host three (3) Mercy Kids Most Improved Student games on June 7, June 8 and on June 12 and each game will feature a pre-game recognition on the field prior to the start of the game. 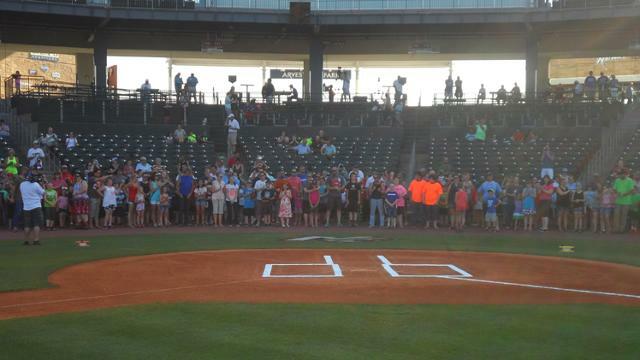 During the 2017 season, the Northwest Arkansas Naturals received a record number of nominations for the Mercy Kids Most Improved Student Program. A total of 1,226 students (up from 1,106 in 2016) were nominated by 734 different teachers. The total number of schools participating also increased from 86 in 2016 to nearly 175 in 2017. Each student that was nominated received two (2) tickets and a Kansas City Royals Kids Zone pass to their choice of either the June 7, June 8, or June 12 games. Prior to each, the Northwest Arkansas Naturals will honor these Most Improved Students with a pre-game parade on the field where they'll be recognized in front of the crowd. Note that the pre-game recognition on Wednesday, June 7 will occur in-between games since it is a doubleheader. Teachers were asked to submit nominations of student(s) in their class who have shown the most improvement since the start of the school year. Measuring improvement in the classroom can be very subjective, so the guidelines for student nominations were left up to the discretion of each teacher as they could nominate students that made strides with their behavior, social involvement, academic improvement or any combination of these. For more information on the Mercy Kids Most Improved Student Program fans can visit www.nwanaturals.com, call (479) 927-4900, email groups@nwanaturals.com, or stop out at the Administrative Office at Arvest Ballpark. Follow the Northwest Arkansas Naturals on Twitter @NWANaturals all throughout the year by using the hashtag #NaturalPastime and #CrowntoCrown for information on tickets, groups, promotions, roster, standings, statistics, and Naturals alumni in the Major Leagues.